Tag "justice league suicide squad"
Wow, this series is great. I mean really great. It’s hard to think of how it could be done better. 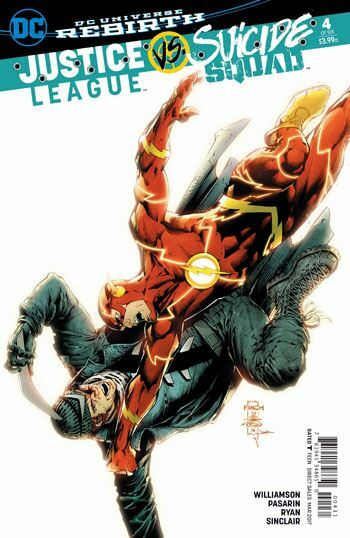 As if last issue’s battle between the Justice League and Suicide Squad was not enough, this issue sees more wild action, as the two teams combine to battle Maxwell Lord’s group of villains. 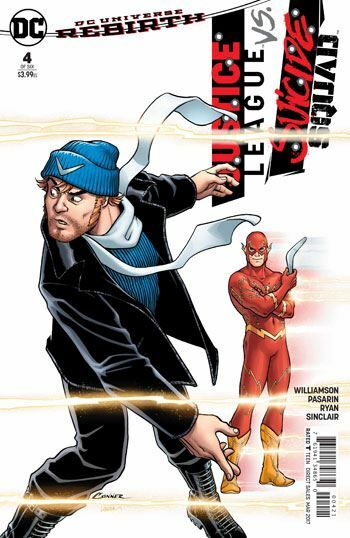 As it was in the previous issue, each of the cadre that Maxwell Lord has gathered gets a chance to shine. Maxwell Lord himself demonstrates how effective his persuasion power can be. Rustam and Katana have an impressive duel. The Emerald Empress might not fare too well against the Green Lanterns, but her role is really part of a larger picture, that much is clear, teasing a return for the Legion of Super-Heroes. Johnny Sorrow gets a particularly impressive display of his abilities, bringing the denizens of the King of Tears to add more chaos to the situation. It’s really only Dr. Polaris who doesn’t come off as impressively as he might. And Lobo, well. It’s a battle and half just dealing with that character. The art is exceptional, almost as extreme as Simon Bisley got with him. I will say that Batman gets to be the one to take him down, but I won’t tell you how. It’s far too good to spoil. As is the ending. There was a slight hint as to where this was going in the previous issue, and more hints scattered throughout this one before the big reveal. Suffice it to say that, as many great fight scenes as this miniseries has already hosted, next issue promises to top them.